August was another differentiating month for Brandywine. Our positive performance was in sharp contrast to the substantial volatility and negative returns suffered by investors in the world’s stock markets. As can be seen, adding 20% Brandywine to an investment in the S&P 500 both increases returns and decreases risk. This is despite the fact that the S&P 500 total return index is just one month past its highest-ever monthly close and Brandywine is in our largest drawdown to date. In other words, because of our non-correlation with stocks, Brandywine adds value to stock portfolios not only when we’re outperforming stocks, but even when we underperform. If Brandywine can add this much value when we’re down, think of the value we add when we’re performing strongly. In addition, Brandywine provides the same diversification value to a portfolio of CTAs, as the major CTA indexes all dropped during August while Brandywine gained. Allocating 20% of a CTA portfolio (also referred to as managed futures) to Brandywine also both increases returns and decreases risk. And for long-term investors our current drawdown may present an excellent entry opportunity for a new investment. As a bonus, Brandywine can be added to your portfolio without requiring any reallocation of existing assets. We can be purely additive. Call or email us to find out how. In the first 38 months of trading in Brandywine’s Symphony Program, investors earned a cumulative 27% (and investors in our aggressively-traded Brandywine Symphony Preferred Fund gained an explosive 127%). The Sharpe ratio on both programs exceeded 1.0. What made this performance stand out even more was the fact that most other futures traders posted losses throughout this period. In contrast, the past 11 months have been the most difficult on record for Brandywine Symphony, which has posted a drawdown of 16%, while other futures managers have thrived. In this report we’ll take a look at the two periods with the intent of understanding the differences between the strong performance of the first 38 months and the more recent drawdown. An evaluation of Brandywine’s performance during the positive first 38 months of trading reveals that profit contributions came from a wide range of investment strategies and markets. Moreover, these contributors varied over time. No single market, sector or investment strategy dominated over the entire period. However, the profits were not the result of one continuous move higher in performance. As you might expect, there was an ebb and flow of performance over that period. These can be shown as three distinct positive periods interspersed by two drawdown periods (prior to our most recent drawdown). The positive periods were simply the result of a majority of our investment strategies being in sync with the markets and producing profits, while the opposite was true of the drawdown periods. The Value group encompasses a number of different strategies, each based on a distinct Return Driver. But they share the common belief that markets will revert to their true value over the longer-term. We realize that good value can turn into great value if markets trend lower. Indeed, a key characteristic of these strategies is that they often accumulate losses before their value is realized (but often, the greater the shorter-term downside, the greater the ultimate upside). Because of our understanding that these strategies can be overwhelmed and generate losses in the shorter-term, we include a separate group of strategies in the portfolio that are designed to thrive in such conditions. These are Brandywine’s “Alpha Hedge” strategies. Alpha Hedge strategies profit from extended moves in markets (this is how they generate their “alpha”). Their performances tend to be roughly correlated with trend following or momentum strategies. One environment in which they are designed to prosper is exactly the sort of emotionally-trending markets that can be dangerous to the Value strategies. As such, they provide a great complement to Brandywine’s Value strategies (which is why we label them Alpha “Hedge”). This was seen during the drawdown. As Brandywine’s value strategies produced losses, Brandywine’s Alpha Hedge strategies worked as planned and captured profits from the very trends that caused those losses. Through June, profits from Alpha Hedge more than offset the losses from Value. Unfortunately, both groups of strategies lost during July. Throughout the strong performance over the first 38 months, the Fundamental and Sentiment strategies tended to be Brandywine’s most consistent performers. Their performances not only complemented each other, but often the strategies categorized within these groups would profit when Value or Alpha Hedge were losing. This is the basis of Brandywine’s portfolio allocation model, which endeavors to maintain balance among the strategies and markets in the portfolio with the intent of smoothing out overall performance. This favorable characteristic was turned on its head over the last 11 months, as Brandywine’s Fundamental and Sentiment strategies contributed to the drawdown. Had the strategies simply performed as they had over the first 38 months (which was in line with expectations), there would have been no drawdown. Whereas the first 10 months of the current drawdown can be attributed to a slight profit in the Value-Alpha Hedge combination being offset by stark underperformance in Brandywine’s Fundamental and Sentiment strategies, July’s loss was fully caused by the selloff in commodities (crude was down more than 20% and all major commodity indexes fell in the double digits), which hurt the performance of the Value strategies. Unfortunately, Alpha Hedge did not serve as a hedge during the month, but actually added to the losses. The Fundamental and Sentiment strategies were essentially flat on the month. Although the final loss was in the range of what we would consider “extreme,” it was achieved by a gradual erosion of performance throughout the month, rather than by one or a few sizable down days. In fact, Brandywine’s value-at-risk (VaR) declined to its lowest levels in more than a year and our margin-to-equity ratio (another measure of market exposure), fell into the lowest decile of the past year. In other words, the portfolio allocation model did what it could do to contain losses, but pervasive losses across all strategy groups led to cumulative losses, without respite. While we obviously cannot predict the future, past drawdowns have each been followed by strong recoveries—with the largest drawdowns being followed by the largest recoveries. And while we are disappointed in the performance of our strategies over the past year, we are confident they remain valid and are based on sound, logical Return Drivers. It is our belief that the first 38 months of Brandywine Symphony’s performance is more representative of what to expect going forward than is the past 11. At a dinner in late 2013, Brandywine’s principals spent some time talking with the alternatives head at one of the large research firms. She made the comment that it appeared to be getting more and more difficult to capture alpha (excess returns over those earned simply by buying the “market”). We’ve continued to hear this refrain from others more recently as well. For readers of these reports, you understand that alpha is simply the term people use to describe Return Drivers that are not yet widely disseminated or accepted in the public domain. Which means that, almost by definition, alpha should always be difficult to find, as it’s only alpha if its not commonly known! But that’s not the reason people state alpha is hard to find. The primary reason for those comments is that most people do not yet embrace a Return Driver based approach to investing and instead try to uncover alpha by looking in the same places that others are looking. Unfortunately, it’s over-tilled ground and unlikely to be fertile territory for new discoveries. In contrast, it’s our belief that there are numerous sources of alpha available to be exploited. Brandywine has looked at hundreds of potential Return Drivers and we have been comfortable enough with a few dozen of them to incorporate them into the investment strategies used in Brandywine’s Symphony Program. Without getting into specifics (obviously, we need to be careful not to expose our sources of alpha lest we turn them into ‘smart beta’), let’s look at a recent example of two that have contributed to Brandywine’s positive performance this year. A number of Brandywine’s investment strategies are based on Return Drivers designed to exploit people’s behavior. Over the past few decades, due to the excellent research conducted by people like Amos Tversky and Daniel Kahneman, what many previously suspected has been proven. For a variety of reasons, the average person is a terrible investor. The vast majority of people underperform the very funds into which they invest— by as much as 5% per year on average. This indicates the potential for an investment strategy based on a Return Driver designed to exploit this behavior by ‘fading’ the crowd. In particular, one of Brandywine’s strategies captures returns by looking at money flows into and out of bond and stock market ETFs. When the flows indicate irrational exuberance, the strategy takes short positions and in periods of despair, the strategy potentially enters into long positions. While many other futures managers have struggled in 2015, this approach proved profitable throughout the first half of this year. A second strategy, also designed to exploit people’s behavior, uses measures that indicate people’s expectations for future price levels in a broad range of markets. It uses this information to selectively enter into positions in deferred futures contracts. Investment strategies based on this Return Driver have been Brandywine’s strongest performers to date in 2015. Because these strategies are based on Return Drivers that exploit human behavior, we don’t expect them to be negatively affected by some of the ‘usual’ excuses assigned to the apparent decline in other sources of alpha, such as central bank intervention, high frequency trading or the globalization of markets. But these are only a couple of the dozens of Return Driver based investment strategies employed by Brandywine. There are dozens, if not hundreds, of other relevant Return Drivers that can be developed into strategies to profit from the movement of hundreds of other markets. This provides the fuel for Brandywine’s ongoing research. In a recent television interview, the head of the asset management arm of one of the world’s largest private banks remarked that her number one concern was what the Fed would be doing. She is not alone; numerous other investment managers have expressed the significance of Fed decisions on the performance of their portfolios. Many believe the bond and stock markets are artificially priced (read “higher”) today as a result of the Fed’s actions or anticipated actions. Even Mohamed El-Erian, who rode the bond bull market to fortune and fame while at PIMCO, has stated that the majority of his money is now in cash, as he thinks most asset prices have been pushed by central banks to very elevated levels. He admits this means his portfolio value runs the risk of being diminished due to inflation, but prefers the inflation risk over the risk of having a Fed decision damage his portfolio. Concern over Fed action (or inaction) is not the problem. It is merely the symptom of a much larger and pervasive problem. Because their portfolios are dominated by long stock and bond positions, these people have subrogated their investment responsibilities to a handful of people at the Fed (if not just one person!). Literally trillions of dollars of other people’s money is essentially out of their control. Not only is this ridiculous, but it is also unnecessary. Long positions in stocks and bonds are only two potential ways to make money. In fact, to rely on portfolios dominated by long stock and bond positions is not investing at all. It is gambling (defined in this instance as a person taking unnecessary risks with their/your money), especially when the performance of those long stock and bond “poor-folios” is under the influence of a single decision maker, the Fed. But even without that dependency, it is a gamble to rely on the continued advance of stocks and bonds to produce positive returns. And it is unnecessary because there are so many additional opportunities available for people to truly diversify their portfolios. Portfolio diversification is the one “Free Lunch” of investing. It enables a portfolio to target both higher returns and less risk than a less-diversified portfolio. But while portfolio diversification is often preached, it is seldom practiced. That is because of the misguided focus on spreading money across long positions in “assets” or “asset classes.” By their very definition, asset classes are comprised of a group of securities that exhibit similar characteristics and perform similarly. So, very little diversification value can be obtained by spreading money across assets within each asset class. And if a “poor-folio” is constrained to only holding long positions in asset classes, and if those asset classes are subject to the same event risk (such as a Fed decision), then spreading money across asset classes provides little diversification value. Fortunately, there is an alternative. A Return Driver is the primary underlying condition the drives the price of a market. Today, both stock and bond markets are dominated by Fed action. That is the single dominant Return Driver. But rather than subject your portfolio to a single Return Driver, which results in singular event risk, you can diversify across numerous other Return Drivers. Not only will this diversify risk, but it will also create a portfolio that behaves independent of stocks and bonds. This is the approach taken by Brandywine. In addition to dramatically reducing the risk that an adverse Fed decision (or any single event) would have on the portfolio, this approach also results in performance that is completely uncorrelated to the performance of all other investment indexes, including stocks and bonds. Bottom line: if you have a portfolio that is long stocks and/or bonds, or other Fed-dominated assets, and are concerned with how a drop in asset values will negatively affect your portfolio, adding an investment in Brandywine will create important diversification value. 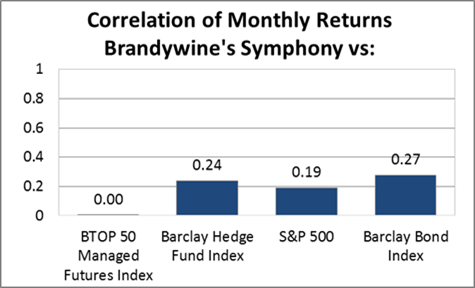 That is the (non) correlation of monthly returns of the BTOP 50 managed futures index to Brandywine’s Symphony Program. That is the (non) correlation of monthly returns of the S&P 500 total return index to Brandywine’s Symphony Program. Comparisons to other investment indexes, such as bonds, hedge funds or REITS show a similar characteristic. Put simply, Brandywine’s Symphony Program produces performance that is uncorrelated to virtually all other investments. This low correlation means that adding Brandywine to a portfolio of CTAs, stocks, bonds, hedge funds or most any other investment will both enhance returns and reduce risk. From the start, we have stressed how Brandywine’s return driver based investment methodology would produce uncorrelated returns. Investors understood that when they compared our diversified, multi-strategy approach to the “traditional” investments such as stocks and bonds, whose returns are dominated by just one or two return drivers. But because Brandywine is registered as a CTA, and trades pursuant to a systematic, diversified approach, many assumed we would be correlated to trend following CTAs. It has become unmistakable that Brandywine’s Symphony Program is also unique among CTAs. A clear distinction is that we produce uncorrelated returns while trading systematically across a globally-diversified portfolio. Other uncorrelated CTAs achieve their non-correlation either by using discretion in their approach, focusing on specific markets, sectors or strategies (such as only employing short-term trading), or selling option premium. In contrast, Brandywine’s diversification value to a portfolio comes from our use of dozens of distinct return drivers, not a specialized focus or use of day-to-day discretion. Although we are required to state that past performance is not indicative of future performance, we believe that this diversity of strategies and markets produces more consistent, sustainable and predictable returns than the other methods used to produce uncorrelated results. What’s perhaps even more interesting is that Brandywine’s various trading strategies are even uncorrelated with each other. 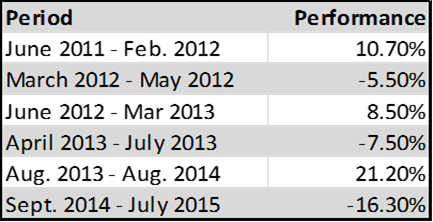 The average correlation of monthly returns of each of Brandywine’s strategies to the others in our portfolio is 0.00. What this means is that by including Brandywine’s Symphony Program in a portfolio of CTAs, we can both increase overall returns and reduce risk. For example, during the period when the BTOP 50 index suffered a sustained 5% drawdown from the start of Brandywine’s trading in 2011 through September 2013, Brandywine’s Symphony Program gained more than 8%. Brandywine provides the same diversification value to equity investors. Although the S&P 500 has been on a tear since Brandywine’s Symphony Program began trading in 2011, the S&P 500 did suffer one significant losing period during the third quarter of 2011. During that period, while the S&P 500 fell more than 18%, Brandywine gained more than 6%. We look forward to showing you how including Brandywine in your portfolio can enhance returns and reduce potential risk. The time to add Brandywine is now, while other investments are hitting new highs in performance. A record 120 million people watched the New England Patriots defeat the Seattle Seahawks in Sunday night’s closely fought Super Bowl. While there were many highlights, it is the “2nd and goal” from the one yard line with 20 seconds left in the game that will forever be etched into the minds of Seahawks fans. Instead of handing the ball to star running back Marshawn Lynch, Seahawks coach Pete Carroll called for a quick slant pass to Ricardo Lockette. It is often said that defense wins games, especially the big games like the Super Bowl, and Sunday night proved no exception. Instead of a game-winning touchdown (or at worst an incomplete pass that leads to a touchdown run by Lynch on third or fourth down), undrafted rookie safety Malcolm Butler intercepted the pass and ended Seattle’s chance for a repeat Super Bowl win. One ‘fatal’ mistake resulted in the New England Patriots taking home the Super Bowl XLIX trophy. We repeat this play-by-play – at the risk of boring those 120 million people who watched the real game – because we’d like to stress the point that defense is perhaps even more important to successful investing than it is to winning football. -13.94% peak-to-trough drop in value, and our aggressively-traded Brandywine Symphony Preferred is down more than 38%. While we would love to avoid all drawdowns, the key is to avoid disaster – the investing equivalent of a goal line interception. As we’ve discussed in many of these reports over the past few years, Brandywine attempts to constrain our drawdowns and improve our odds for a rapid recovery by creating a balanced portfolio that employs broad portfolio diversification across both trading strategies and markets. So, although our current drawdown is our largest, it is still within a manageable range. But while this balanced, diversified approach improves our probabilities of avoiding disasters, it can never eliminate drawdowns. The current drawdown, which began in September, is a great case in point. Over the past five months, global markets became much more correlated with each other, as the sharp rally in the dollar and the over-supply in the oil markets triggered a succession of related market moves in bonds and commodities. The majority of Brandywine’s fundamental, sentiment and arbitrage-based trading strategies were on the wrong side of many of these moves – which is essentially the definition of what causes a drawdown. Despite this, our monthly losses have been better contained each month, as both the trading strategies and portfolio allocation model adapted to the changing market conditions. And because we have avoided disaster-sized losses, we are still “in the game” and able to apply the same game plan going forward as what made us successful in the three years leading up to our current drawdown. From the start of trading in Brandywine’s Symphony Program in 2011, we have stressed how our systematic Return Driver based approach to trading, which includes a heavy dose of fundamental inputs, will produce returns that are uncorrelated to not only all conventional investments (such as stocks and bonds) but also to other futures traders. This is reflected in our non- correlation to the S&P 500 of 0.15 and even lower correlation to the BTOP 50 managed futures index of 0.09. A specific trade example of this non-correlation took place on January 15th, when the Swiss National Bank abandoned its support for their currency’s peg to the Euro. The majority of trend followers were caught short and suffered losses on this move. In stark contrast, Brandywine’s trading strategies recognized that despite sustained central bank intervention the Swiss Franc continued to rise against the Euro. As a result, Brandywine was net long the Swiss Franc and profited from its sharp advance on that day. “Stay the Course” or Modify the Game Plan? There is almost never second-guessing when a team is blowing away the competition or when an investment manager is minting money. The second-guessing only takes place when losses are incurred. While we at Brandywine have certainly scrutinized our performance closely over the course of our current drawdown, with an interest in identifying where and why the losses accrued, we are fortunate that our investment philosophy provides us the path to improvement, without the need to second guess. That is because our model was designed from the start to enable – actually require – us to develop and incorporate any additional trading strategies with the intent of further diversifying the sources of our returns. Also, as we continue to collect more real time trading and performance data, our portfolio allocation model will benefit by being able to use that information to improve the portfolio balance across both trading strategies and markets. While buying drawdowns is often difficult to do emotionally, we continue to believe that the current drawdown presents a great opportunity to initiate or add to an investment with Brandywine.